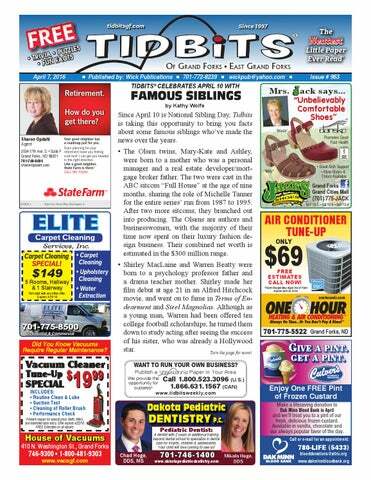 FAMOUS SIBLINGS Since April 10 is National Sibling Day, Tidbits is taking this opportunity to bring you facts about some famous siblings who’ve made the news over the years. •	The Olsen twins, Mary-Kate and Ashley, were born to a mother who was a personal manager and a real estate developer/mortgage broker father. The two were cast in the ABC sitcom “Full House” at the age of nine months, sharing the role of Michelle Tanner for the entire series’ run from 1987 to 1995. After two more sitcoms, they branched out into producing. The Olsens are authors and businesswomen, with the majority of their time now spent on their luxury fashion design business. Their combined net worth is estimated in the $300 million range. •	Shirley MacLaine and Warren Beatty were born to a psychology professor father and a drama teacher mother. Shirley made her film debut at age 21 in an Alfred Hitchcock movie, and went on to fame in Terms of Endearment and Steel Magnolias. Although as a young man, Warren had been offered ten college football scholarships, he turned them down to study acting after seeing the success of his sister, who was already a Hollywood star. Turn the page for more! WANT TO RUN YOUR OWN BUSINESS? We provide the opportunity for success! Present coupon for special price. Belts, filters, and extended labor extra. Offer expires 4/22/16. FREE Estimates on all repairs. Call (701) 205-1157 or vis Forks, ND 701-775-5522 When Grand you need us, www.onehourair.com Ask about Military and Senior Discounts One Hour® is here to help. a pint . We Offer thea Following Services: get pint . As part of our Give A Pint, Get• ATechnicians Pint program, are Drug we’d like to thank you for your lifesaving donation Background Checked to Dak Minn Blood Bank in April by treating you to a pint of our fresh, delicious frozen custard. Available • Fully Equipped Big in vanilla, chocolate and our always popular flavor Make aoflifesaving donation to ® • Latest Technology for Frozen the day, Culver’s Dak Minn Bloodis Bank in April Custard so smooth and creamy, Detection, and Repair and we’ll it’s treat youthan to aicepint of our better cream. SPRING SPECIAL! Cool your Deck or Patio with a Motorized Sunsetter Awning! 6. She was in the TV show “Family Ties.” Her brother was in “Arrested Development.” Who are they? 7. What brothers appeared on their father’s TV series “Sea Hunt”? 8. What two brothers both played for the Baltimore Orioles in the late 1980s into the early 1990s? 9. Name the five brothers in the musical group the Jackson 5. 1. What brothers used the line, “Mom always liked you best!”? 2. What group of siblings sang “I’m So Excited”? 3. Name Emilio Estevez’ famous brother. 4. What brothers made history in Kitty Hawk, North Carolina? 5. Who recorded “Bye Bye Love” in 1957? 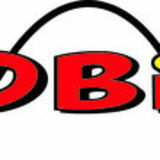 www.TidbitsGF.com PLEASE TELL OUR ADVERTISERS YOU SAW THEIR AD IN TIDBITS! land won tennis’ Davis Cup. 4. In what decade was the last time Mississippi State won and SEC championship in football? 5. Name the last time before 2014 that the Portland Trail Blazers won an NBA playoff series. 6. In 2015, Jeff Gordon set the record for most consecutive NASCAR Cup starts. Who had held the mark? 7. Which NHL team ended Montreal’s 9-0-0 start to the 2015-16 season? •	New Jersey brothers Paul, Joe, and Nicholas Jonas have sold upwards of 17 million records. Formed in 2005, they are the youngest band to be featured on the cover of Rolling Stone magazine. •	Baby boomers will remember the character of Opie Taylor on “The Andy Griffith Show,” a role that Ron Howard played for eight years. The Oklahoma-born Howard appeared in his first movie at 18 months, but had his first credited role at age 4. As a teenager, he began a six-year stint as Richie Cunningham on the popular sitcom “Happy Days.” At age 25, he left the series to focus on a career as a director. His many successful films include Cocoon, Apollo 13, A Beautiful Mind, The Da Vinci Code and Frost/Nixon. Ron Howard has cast his younger brother Clint in 16 of the films he has directed. Clint was also a child star, appearing in the 1960s series “Gentle Ben” as the son of a Florida Everglades game warden who kept a bear as a pet. Ron is worth a little more than his brother -- $140 million to Clint’s $20 million. •	There were more sets of siblings competing in the 2014 Winter Olympics than any other. Seven sets of siblings on Team USA competed either as teammates or as rivals, along with Ukraine’s female twins, three sisters from Switzerland, another three sisters from Canada, and two brothers from Norway. Two of the three Canadian sisters took gold and silver in the moguls event. In the men’s double luge event, two Austrian brothers won the silver medal, while two Latvian brothers took the Bronze. Dutch twin brothers won gold and bronze in the men’s 500-meter speedskating race. Over the years, there have been 19 families who have had three or more siblings compete at the Winter Olympics. The record is held by the Spanish Fernandez Ochoa family, who had three brothers and two sisters competing. Channel, and others. • Product Specialist and Video Spokersperson for Dodge Group. • Automotive Journalist & Author of 4 books. FAMOUS SIBLINGS (continued): •	The Aurness brothers were born in the 1920s to a businessman and his journalist wife. James was the elder, who had his eyes set on being a World War II fighter pilot, but his height of 6’7” made it impossible. Instead, he served as an Army infantryman in Italy, where his leg was severely injured by machine-gun fire. After the war, James and his brother Peter, also a WWII vet, pursued careers in the entertainment field and both became well-known television actors in very different roles. James, who dropped the “u” in his name, became James Arness, the star of TV’s “Gunsmoke,” a long-running western set in 1870s Kansas. For 20 years from 1955 to 1975, Arness was Marshal Matt Dillon on the series, along with several made-for-TV “Gunsmoke” movies after the regular series ended. His brother changed his name to Peter Graves and became famous in his role of Jim Phelps, the director of the Impossible Missions Force on TV’s “Mission Impossible” from 1967 to 1973 and again from 1988 to 1990. The highlysuccessful 1980s comedy Airplane! films featured Graves as Captain Clarence Oveur, the pilot of a Boeing 707. •	The 1977 Saturday Night Fever movie soundtrack album, recorded by siblings, Barry, Robin, and Maurice Gibb sold 15 million copies and was Album of the Year, with five the songs making it to #1 on the charts. The Gibbs composed half of 1978’s biggest songs, with Barry and Robin once writing three #1 singles in one afternoon. Their sales exceed 220 million records. Of the three, only Barry survives, Maurice having died from intestinal problems in 2003 at 53, and his twin Robin succumbing to cancer in 2012. There’s a wide variety of enrichment activities available this summer at the University of North Dakota such as athletic and educational youth camps, professional seminars, and social events for all ages. Visit our website for a full listing of what Summer @ UND has to offer from May 15 to August 15. *Installation must be booked by April 15, 2016. In-stock only. •	It was 19th-century Russian playwright and short story writer Anton Chekhov who made the following sage observation: "Love, friendship, respect, do not unite people as much as a common hatred for something." •	If you suffer from galeophobia you're certainly not alone; Steven Spielberg's 1975 film "Jaws" may have popularized the fear of sharks, but it certainly didn't start it. Logically, though, swinophobia makes more sense -- pigs kill more people every year than sharks do. •	You might be surprised to learn that Harriet Tubman -- famous for her work as a conductor on the Underground Railroad -- also served as a Union spy during the Civil War, providing key intelligence that aided in the capture of Jacksonville, Florida. She also was the first woman to lead an armed assault during the Civil War; the Combahee River Raid freed 750 South Carolina slaves. She even continued her humanitarian work after the war, opening the Harriet Tubman Home for the Aged and Indigent in Albany, New York. •	According to the nuns who worked with her, Mother Teresa's last words were, "Jesus, I love you. Jesus, I love you." According to her doctor, the last thing she said was actually, "I can't breathe." •	If you wanted to erect a building in Colonial times, you'd go to an undertaker; that's what building contractors were called back then. •	Ancient Romans recognized three distinct forms of kissing: The word "basium" denoted a kiss between acquaintances, "osculum" was used for a kiss between close friends, and "suavium" described a kiss between lovers. *** Thought for the Day: "Catch-and-release -that's like running down pedestrians in your car and then, when they get up and limp away, saying, 'Off you go! That's fine. I just wanted to see if I could hit you.'" -- Ellen DeGeneres © 2016 King Features Synd., Inc.
For new customers by appointment Validprohibited at participating locations. Cannot be combined with oth apply. only. Void where by law. Valid 3/1-4/10/2016. offers or used toward past services. One coupon per customer and per return. Other exclusions may apply. Void where prohibited by law. Valid 3/1-4/10/2016. April 14 is National Dolphin Day, and what better time to examine the specifics on this group of marine animals! •	The word “dolphin” comes from the Greek word “Delphis,” which translates to “womb,” leading to an interpretation of the meaning as “a fish with a womb.” Yet they aren’t fish at all, but mammals who breathe air, give birth to live young and nurse them with milk, and are warm-blooded, maintaining a constant body temperature. They do have hair, but only when they are first born. It falls out within two weeks, and doesn’t grow again for the remainder of their lives. •	Of the 43 species of dolphins in the world, 38 are marine dolphins, living in saltwater, and five are river dolphins. The marine dolphins live mainly in shallower water near coastlines in warmer locations, and are common in Southern California, Chile, the tip of South Africa, and the Gulf of Mexico. Yet they’ve been found from Nova Scotia to Norway. •	The most well-known species is the Bottlenose Dolphin. Because of the design of their face, they always appear to be smiling. The Bottlenose is large, ranging from 10 to 14 feet long and weighing up to 1,100 pounds. Their size varies according to their location, with living in cooler bodies of water a larger size than those in warmer temperatures. •	Dolphins come up for air every few minutes, only able to remain submerged for up to 4½ minutes without a breath. While traveling in their pods, each has a distinctive whistle that helps the others recognize them. •	We’ve all seen photos of dolphins leaping high into the air. A dolphin can vault up to 20 feet into the air before splashing back into the water. It could be they are dislodging parasites such as sucker fish or barnacles, or to escape predators. •	The number of a dolphin’s teeth varies from eight up to 250, with only one set of teeth for life. Consuming between 10 and 35 pounds of food each day, they use their teeth to catch their prey, but not to chew it, rather, they swallow their dinner whole. •	As far as senses, they have excellent vision, both in and out of the water, with special corneas that adapt to both conditions. Although their ear openings are only small the middle ear, it’s believed that sound moves to the inner ear via fat lobes located in the jaw and other bones in the skull. Their sense of smell is poor, due to the absence of olfactory nerves. •	Dolphins are the second most intelligent animals, behind human beings. MRI scans of dolphin brains indicate a large brain with an intricate neocortex, and capable of experiencing emotions. They are highly trainable, and actually pass their knowledge on to fellow dolphins. They exhibit concern for other animals, staying and helping the injured, even saving the lives of humans in some cases. •	Did you know that the orca killer whale is actually a member of the dolphin family, the largest member of Delphinidae category? •	Living in the wild, a male dolphin will have a lifespan of 40 to 45 years, while a female can live to age 50. •	On April 13, 1742, Handel's "Messiah," one of the world's most beloved musical works, premieres in Ireland. Although now associated with Christmas, "Messiah" made its world premiere during the Christian season of Lent. •	On April 12, 1861, Confederate Gen. P.G.T. Beauregard opens fire on Union-held Fort Sumter in South Carolina, launching more than 4,000 rounds. Two days later, President Abraham Lincoln issued a proclamation calling for 75,000 volunteer soldiers to quell the Southern "insurrection." Dad: "Don't be selfish. Let your brother use the sled half the time. Son: "I do, Dad. I use it going down the hill and he gets to use it coming up!" A boy was taking care of his baby sister while his parents went to town shopping. He decided to go fishing and he had to take her along. "I'll never do that again" he told his mother that evening. "I didn't catch a thing!" "Oh, next time I'm sure she'll be quiet and not scare the fish away," his mother said. The boy said, "It wasn't that. She ate all the bait!" •	On April 15, 1912, the ocean liner Titanic sinks into the North Atlantic about 400 miles south of Newfoundland. It was later discovered that the liner Californian had been less than 20 miles away but had failed to hear the Titanic's distress signals because its radio operator was off duty. •	On April 14, 1818, Noah Webster, a Yale-educated lawyer with an avid interest in language and education, publishes his American Dictionary of the English Language. The dictionary, which took him more than two decades to complete, introduced more than 10,000 "Americanisms." •	On April 11, 1988, actress and singer Cher collects the Academy Award for Best Actress for her performance in "Moonstruck." Cherilyn Sarkasian first became famous as the taller, female half of the 1960s singing duo Sonny and Cher. •	On April 17, 1882, several copies of Sheriff Pat Garrett's wildly inauthentic, fictionalized biography, "An Authentic Life of Billy the Kid," arrive at the Library of Congress. The first full, realistic biography of William Bonney (the Kid's principle alias) was not published until 1989. •	On April 16, 1947, a giant explosion occurs during the loading of ammonium nitrate fertilizer onto the freighter Grandcamp at a pier in Texas City, Texas. Nearly 600 people were killed and thousands injured when the ship was literally blown to bits. Its 3,000 pound anchor was found 2 miles away. Score Big When You Advertise in Tidbits! district and state meetings. He will, in short, declare the entire exercise of a contested convention illegitimate. Is it? We are used to the voters directly deciding, and should Trump perform strongly enough to win a majority of delegates, 1,237, they, in effect, will. But if he falls short, the delegates enter the picture. If Trump has only won a plurality of delegates, a badly divided party would be nominating a candidate who couldn’t reach a majority and, so far, has shown no general-election appeal. In this circumstance, delegates would be justified in looking to someone else better suited to win an election and protect the party’s interests. It’s not unheard of for top vote-getters in America to fall short of the top prize. Otherwise, there would have been a Gore administration. Al Gore won the popular vote in 2000, but still fell short of George W. Bush, who won the Electoral College. If you count Michigan, where Barack Obama’s name didn’t appear on the ballot, Hillary Clinton very narrowly won the most votes in the 2008 primaries. That was good enough for an appointment as secretary of state — under President Obama, who understood the delegate-allocation rules much better. Trump has thrived so far without an extensive, traditional political operation. But politics isn’t only about TV interviews and big rallies. There is a reason that the system also rewards candidates who can motivate and muster people to do the grass-roots activism involved in winning small victories at local meetings. This is literally getting people involved in the process, and it could take on an outsized significance in deciding the immediate future of the Republican Party. Trump would be well-served to complain less about the rules, and learn more. Rich Lowry is editor of the National Review. © 2016 by King Features Synd., Inc. Send your tips to Now Here’s a Tip, 628 Virginia Drive, Orlando, FL 32803. © 2016 King Features Synd., Inc.
You probably didn’t know that April 6 has been designated Charlie the Tuna Day, honoring the “spokesman” for StarKist tuna. There’s nothing fishy about these facts. • The StarKist tuna company got its start in 1910 when an immigrant from Yugoslavia, Martin Bogdanovich, started fishing along the California coast. Business was good and in 1918, Martin and five partners established a tuna business, naming it the French Sardine Company. They retained that name until 1942 when the name of StarKist was introduced. •	In the midst of World War II, more than half of StarKist’s production was being used to supply the U.S. Army. In 1952, the company opened a new and expanded tuna cannery on Terminal Island, California. In 1953, they began production of 9 Lives cat food, using tuna by-products. •	In 1961, StarKist hired the Leo Burnett Advertising Agency to create a catchy ad campaign. The Agency was already famous for its creation of the Jolly Green Giant in 1935, Tony the Tiger in 1951, and the Marlboro Man in 1954. (The agency would go on to come up with Fruit Loops’ Toucan Sam in 1963, the Pillsbury Doughboy in 1965, and Morris the Cat and the Keebler Elf in 1968.) An employee of the agency, Tom Rogers, created Charlie the Tuna, based on a good friend of his, Henry Nemo, a jazz composer who was a Cotton Club musician and sometimes referred to as the creator of jive. •	Charlie was created as a hip, cool beatnik tuna with a beret and trendy shades. DIFFERENCES: 1. Wastebasket is missing. 2. Word is different. 3. Nameplate is missing. 4. Envelope is moved. 5. Hair is different. 5. Beads are missing. © 2016 King Features Synd., All rights reserved. •	Most advanced floor protection available today. •	DigitalFit® laser measured for a perfect fit. •	Rigid core for strength. •	Surface friction to the carpet. •	Lower reservoir that channels fluids and debris away from shoes and clothing. •	Available for most makes & models. WE INSTALL: • Lift Kits • Remote Starts • Truck Bedliners • Running Boards / Nerf Bars • Bed Rails • Tonneau Covers • Chrome Accessories • Rims & Tires • WeatherTech Floor Liners • Window Tinting • Hitches • Grille Guards • DVD Headrests • & Much More! "Famous Siblings," "Dolphins" and "Charlie the Tuna"